Seats located in blocks M4 (The Beautiful Game) and M6 (The Chemistry Lounge). Elevated views of the pitch, an exceptional four-course match day menu, Spirits, soft drinks, visit from Former Liverpool FC player, match day gift, free car pass, in-lounge betting facilities and more. Best Available Executive/Private/ VIP Hospitality Package. Match ticket in wing sections of middle tier Main Stand (Blocks M1-3, M7-9). Hospitality package includes a vibrant mix of complimentary street food stalls, Cash bar, Choice of beer, house wine or soft drink at half-time; Visit from Former Liverpool FC player; Complimentary match day programme. AKA Western Union Lounge. 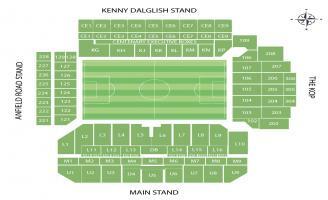 Seats located at Main Stand lower tier (blocks L11 / L12). Package includes: access to bar, lounge & buy street food, complimentary beer/wine/soft drink at half time, Liverpool former player in lounge & match programme.